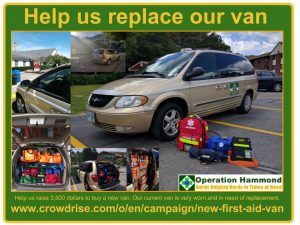 Help us raise 3,500 dollars to buy a new van. Our current one is very worn and in need of replacement. It is a 2001 Chrysler van and is in need of replacement. We ideally need around 3,500 to buy a suitable quality replacement. Our van is a major way we transport member, gear, and supplies to the shows and events we do. It is a critical part of our ability to offer our services. Or buy one of our T-Shirts here: www.inktothepeople.com/operation-hammond or visit our Action Hammond T-Shirt emporium page here. Did you know we are a nonprofit charity that serves the nerd and pop culture community? To learn more about our charitable mission and how you can help or volunteer please check out the various parts of our website or our about us section.